Chester Modern Flotation System with Fast Free Shipping! This mixed media beauty has a Mink finished grill on the headboard and footboard which feature straight vertical lines offset by gently sloping horizontal rails. The four Dark Walnut corner posts are topped with rounded finials that keep this piece looking soft and inviting. The Chester Flotation System includes: Headboard, Footboard, Frame, Support Rails, 8" deep plush-top soft side mattress and 9" foundation for a complete modern flotation system. Available in Queen, King and Cal King sizes. The Chester Flotation System Includes: headboard, footboard, side rails, premium full depth 8" mattress and foundation for a complete flotation system. 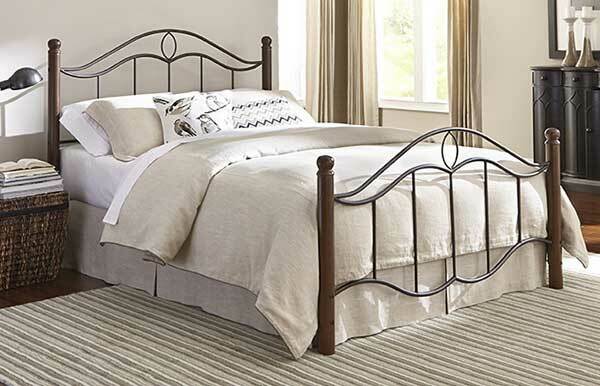 The Chester Flotation Bed Includes: headboard, footboard, side rails. (Does not include mattress).